You know what amazes me about Singapore? The coffee is consistently excellent pretty much everywhere I’ve been. And it’s not like there’s a blooming coffee culture in Singapore they apparently just know how to make everything taste good. 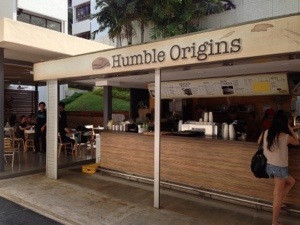 Right near the Economics Department is Humble Origins, a little outdoor cafe where the coffee is really special. Among the best on-campus coffee places I have been to anywhere in the world. It’s also located in a spot where students and faculty are headed in various directions between classes so its a great people-watching spot. They sell muffins (good) and sandwiches (didn’t try) but they no longer sell French toast (??). The coffee is consistently real good also in Holland, Belgium, Germany, France, Italy, Switzerland, and not least, Austria. I expect the parts of the former Hapsburg Empire have recovered their good coffee since the demise of communism. A more economical way of answering the good coffee question might be that coffee is consistently bad only in England and America. But even there it has improved. Don’t know for Singapore, but in Japan sunglasses are not part of a respectable attire. Meaning wearing them is considered a bit rude (things are of course changing but that was the bottom line). Ok for artists, people in the showbiz, or gangsters. Also, I have green eyes and I noticed that in many situations in which I found the sunlight disturbing at least, my Japanese, black-eyed friends are perfectly comfortable without sunglasses. Singaporean here. I’ve never felt any need for sunglasses. I guess it might matter if you had to be in the sun a lot, but that’s not the case in a very built-up place like Singapore. Also, I don’t see the foreign construction workers wearing any so a more likely reason may be that they (and we?) are probably used to it. It seems like people, when they do wear sunglasses, do it for aesthetic reasons, rather than to protect their eyes. And Singaporeans generally don’t care much about aesthetics–you will see they generally dress more poorly and women put a lot less makeup. Just compare them to their East Asian developed country counterparts–Hong Kong, Japan, Korea. Sunglasses, somedays my girlfriend brings hers around everywhere. A large portion of Asians are near-sighted, making it not possible to wear normal sunglasses unless they are also wearing contact lenses. A certain percentage of Asians (at least in HK) think a pair of dark rimmed clear glasses are a fashion statement.